What Should You Look for in a GDS Add-on? We’ve discussed the why of GDS add-ons in a previous blog, and you’re likely aware of their potential for helping you get the most from your GDS. However, not all add-ons were created equal, so how do you sort the wheat from the chaff? What should you be looking for from a potential bolt-on? Many of the challenges faced by the GDSs are challenges of usability, caused by complex or slightly clunky processes. Take for example the way data is passed to TMCs from the GDSs; there’s nothing wrong with the information that’s sent, it does tell you everything you need to know. The difficulty lies in the complexity of the format it’s delivered in: an impenetrable tangle of acronyms, numbers and symbols. While it’s possible to decode this data manually, it makes what should be a relatively simple task (receiving and processing information) difficult. So, the primary function of any tool to solve this issue has to be its ability to make using the GDS simpler. Add-ons like decoders are a great example of this, they don’t do anything ostentatious or complicated — they simply translate GDS-speak into easy-to-read English. But, they do have a positive impact on the usability of the GDS and, consequently, on the travel consultants who use it. While the GDS has undoubtedly been a revelation in terms of the time it saves travel consultants — if you’re in any doubt about that, here’s what things were like pre-GDS — there are still plenty of tasks in a day that could be less onerous. Visa-checking, cross-checking policies, comparing offers and requirements for bookings, double-checking tickets, monitoring flights for seat availability and data entry are all vital parts of the job. However, they can all be incredibly time-consuming when done manually, even with a GDS to help. A plug-in or add-on can make all the difference to the time spent on bread and ‭butter tasks, boosting productivity in the process. For example, an automatic visa-checking tool can drastically reduce the time each visa takes to process. Seat availability monitoring software helps cut down the time you spend checking back and forth between tabs on your browser, instead pinging an email your way when the desired seat becomes available. Likewise, tools like APIS managers can help alleviate the data-entry burden, by not only automating the process of entering advanced passenger information but also reducing the likelihood of human error. These are all examples of how GDS add-ons can quantifiably save travel consultants time and you should demand the same of any tool that you’re considering. Always keep in mind exactly how the tool is going to save you time or increase productivity. Finally, and perhaps most importantly, any GDS add-on you use should benefit the people driving all of this: the travellers. It could be something as seemingly humdrum as making your itineraries a little more customer-friendly. Travel itineraries are a funny thing, probably the most crucial part of a TMC’s communication with customers —after all, the ‘when, where and how’ essentially make or break a business trip—while simultaneously being easily overlooked. But, providing travel information in a consolidated, easy-to-read document is an easy win in the traveller satisfaction stakes. Customer-friendly itineraries aren’t one of the GDS’s specialities, so it’s an aspect of travel management ripe for an add-on. There are itinerary template tools on the market, but not all are of equal quality. You should look for a tool that does more than just draw together the disparate parts of the itinerary: the document should also look great, be easy-to-use and free of unwanted or irrelevant third-party advertising. Another area where GDS add-ons can really contribute to traveller satisfaction is choice. Business travellers are increasingly swayed by those travel companies that can offer them a wide range of choice, particularly when it caters to their individual travel preferences. Unfortunately, while they do offer a pretty comprehensive range, the options available through the GDSs pale in comparison to what business travellers are used to from booking leisure trips. Add-ons like EAN integrators can open up the inventory of large aggregators like Expedia to your customers, without them having to source it themselves. This not only means you’re more likely to be able to cater to each traveller’s individual preferences through the additional choice — with Expedia it could be another 300,000 hotel options — it also has the handy side effect of reducing incentives for your travellers to go ‘off policy’ to find what they need. GDS add-ons have all the potential to turn a functional booking system into an excellent one, it’s just a matter of choosing the right tools. So, when assessing the options available, always keep in mind how your choice will affect your travellers, your staff and the efficiency of your TMC. 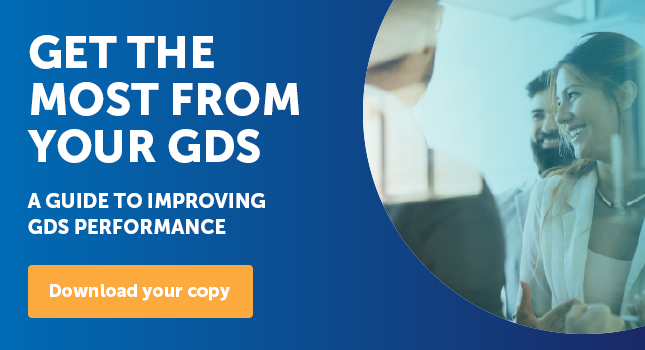 To learn more about the GDS and why add-ons have such a vital role to play in its performance, download our new ebook ‘How to Get the Most From Your GDS'.